So, at first I thought this topic would be kind of hard especially because I didn't know what to say or even how to say it. My take on love may be a little bit different than everybody elses. I believe in soul mates or what we like to say in Arabic as naseeb (fate). I know one can love someone else without having the other person loving back, I have seen many love stories where all of those things happen. 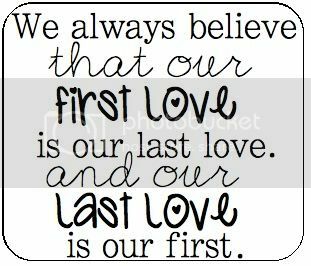 I just don't believe that somebody's first love can somebody who isn't there naseeb. So with that said, for today I am talking about my first love. And that is the person who will be my husband, the person I spend the rest of my life with. He will be my first, and my last love. I know it may sound a little cheesy to some of you- and romantic to some others, but this is something I believe in deeply. A person can always love somebody else- the way we love our friends, and our family, but when somebody is in love.. that is something completely different. When you are in love- nothing can break you, nothing will be able to get in the way of the feeling that you have with that other person. So with that said, I haven't found my first love in my past.